Denise + Horacio are readers. They love reading, and ended up having their wedding at the Spanish Lakes Public Library in Boca Raton, Florida. 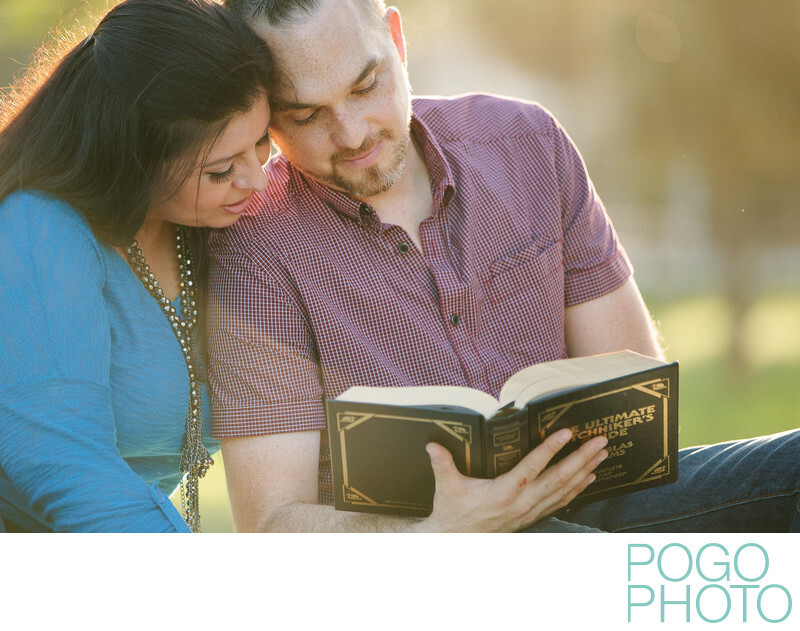 This shot from their engagement session speaks to us because it not only shows a loved copy of one of our favorite books ("The Hitchhiker's Guide to the Galaxy", of course), but it shows their heads drawn close in a tender and classic moment. It's rare in this digital age to read a story to your loved one, but these two made it look just as compelling as any game on your phone. (Probably because it is!) The casual clothing combined with Denise's metallic necklace, which plays nicely off the gilded decorations on the book cover, all pull the viewer closer for a truly intimate moment in a sun drenched, lazy winter afternoon in Florida. Dubois Park is one of our favorite locations for portraits: the landscape is much more varied than other Florida parks, it's rarely crowded, and the sunlight is spectacular in the afternoon. Whenever a client can't decide where they'd like their Florida engagement session this park is one of the first places we suggest. 1/800; f/2.8; ISO 400; 185.0 mm.